Mike Blumenthal seems to be the first to have spotted this, that Google updated the reviews system on Maps to show the terms "poor - fair," “good,” “very good,” or "excellent". Megan Stevenson from Google also announced it on Google+ explaining the new process. 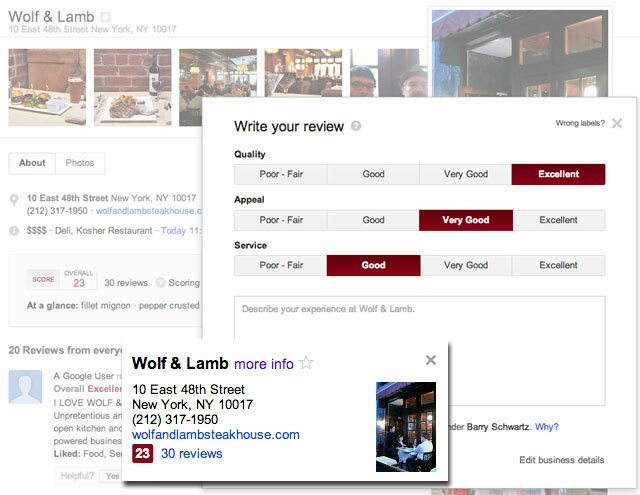 She said it is "easier than ever to write accurate, useful reviews on Google+ Local, thanks to the updated rating scale we rolled out." A user fills out the form as listed above and Google will convert the "ratings into numbers and factor them into the business' precise 30-point score that shows up in Google+, Search and Maps." Is this better than the Zagat reviews?